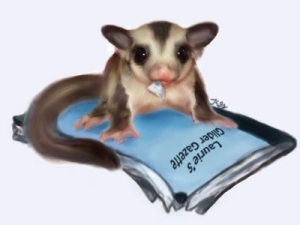 Seeking fun loving people to educate others on glider care, enrichment, how tos, demos, and ???. Looking to add LOTS of laughter to our learning experience this year. Serious topics allowed if you promise to at least trip on your way to the front. Anyone feel like cutting it up with me up front? Thinking about a talk on railroading gliders. Anyone game to take on that one? Oh man got another idea. How about one on SAFE bonding methods??? Any takers? I'm no good with that sort of thing or I'd be glad to. Oh man got another idea was typed at 2:30 in the morning and I put in the wrong topic. What I meant to type was... How about one on SAFE introduction methods??? Yes this idea is in direct response to an other method that was learned about earlier in the year. Any takers? Thanks Suggiemom. Speaking in front of a crowd surely isn't for everyone. I actually remember a time in my life when you would get me up front if you were to drag me kicking and screaming. Imagine that huh? Now you can't get me to shut up and I love having fun with a crowd.